Figure 2-8. 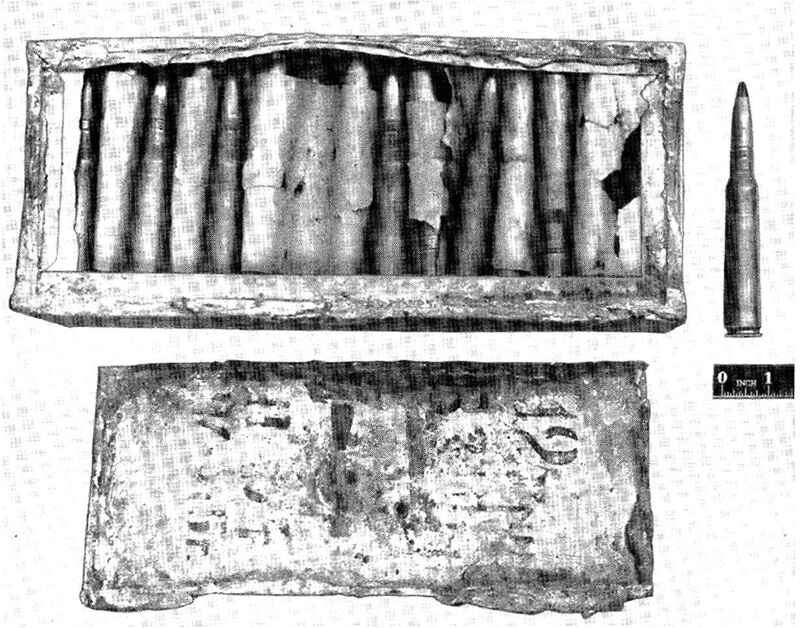 Method cf packing Soviet 12.7-inrn ammunition in bulk. airframe. The dimensions of the NS 37 cartridge, shown in figure 9-19, indicate its unwieldy shape, which accounts for the stresses. 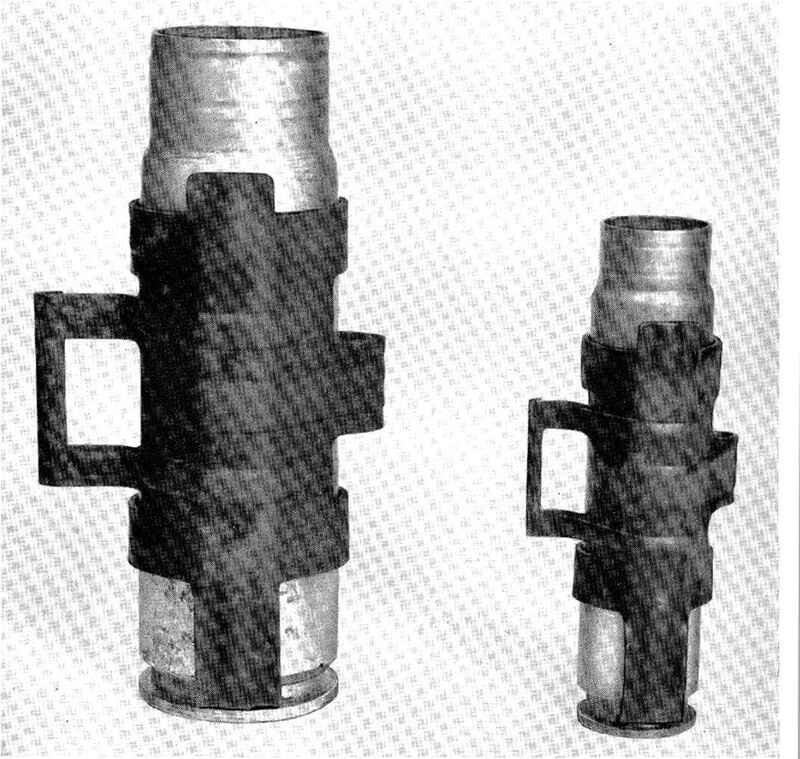 The refinement of the 37-mm gun which followed World War II included a reduction of the propelling charge, permitting the use of a smaller cartridge case. The smaller case, of course, permits shorter parts travel in the gun, but even more important it reduces the bulk of the ammunition. 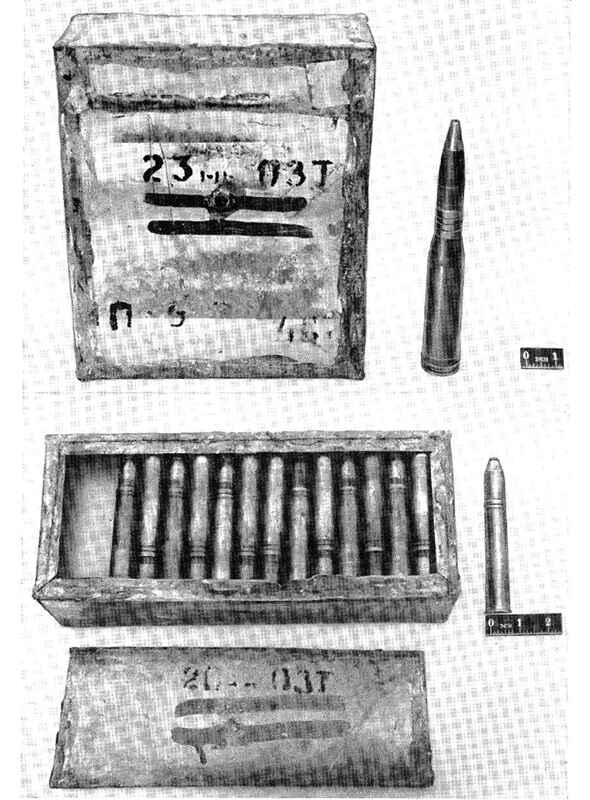 Figure 9- 20 shows a fired case from an i\ 37 gun which was picked up in the Korean theater of operations. 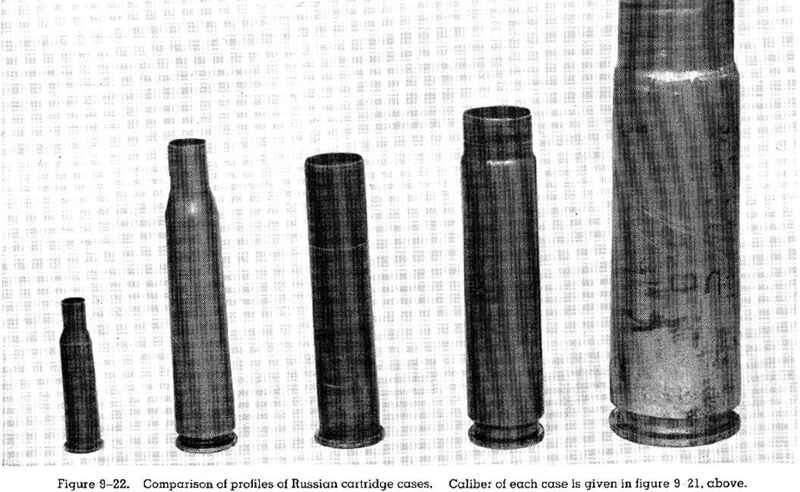 Figures 9-21 and 9 22 are comparisons of base and profile of a representative group of Russian cartridge eases. The two specimens on the right, which arc rcccnt developments, indicate a trend toward a smaller cartridge. Although there is little taper and a rather vague shoulder, the construction of the base and the cannelure follow present trends. Design features of these cases indicate that they are the work of a single designer or group. 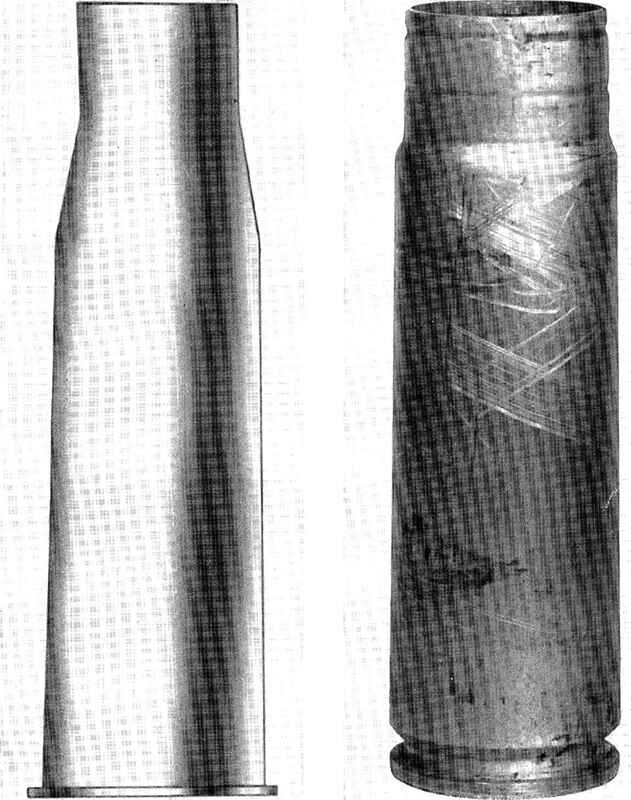 The links used with these two rounds are the stripping type, as shown in figure 9-23. Withdrawal type links, shown in figure 9-24, arc used in all the Shkas, Shvak, Be resin, and VYa aircraft guns. 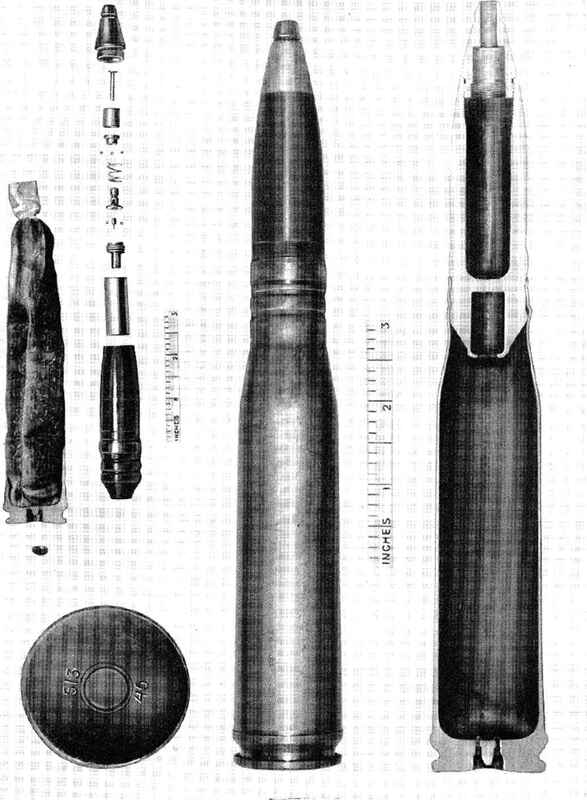 All four types illustrated were used in World War II. The rifle-caliber link used in the Shkas can be used in the DS and SO 43 ground guns as well as the aircraft gun for which it was designed. Figure 9-11. Bulk shipping containers lor Soviet aircraft cannon ammunition. Top, 23-mm, and bottom 20 mm. Figure 9 12. 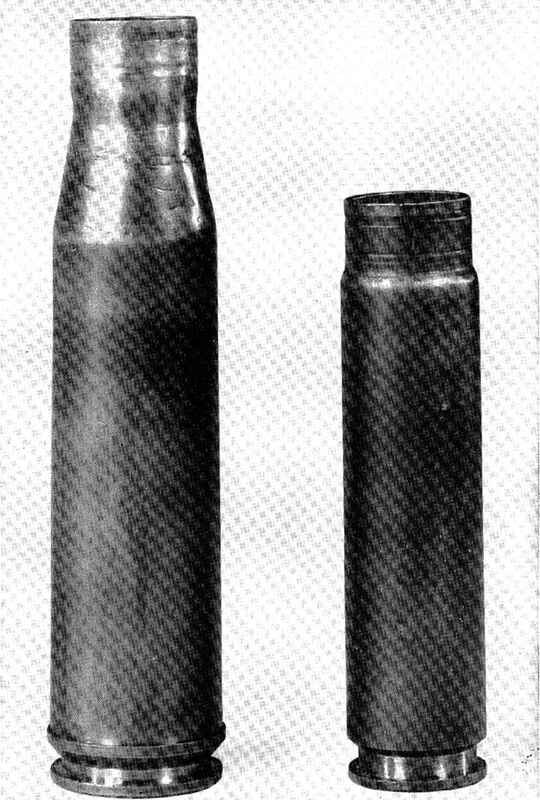 The 20-mm Shvak round compared with the old caliber .75 Gatling round. Figure 9-13. 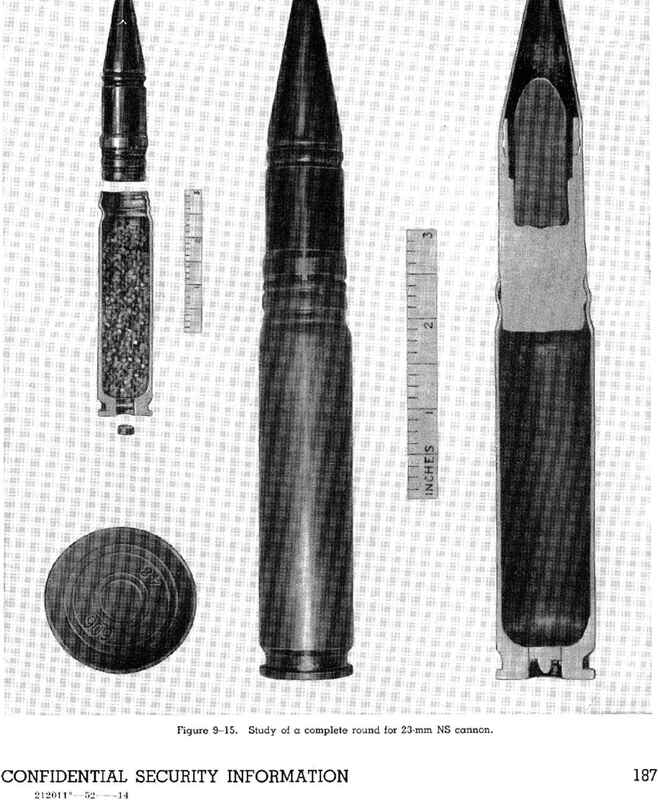 Study of a complete round for the 23 mm VYa cannon. Hgure 9-17. 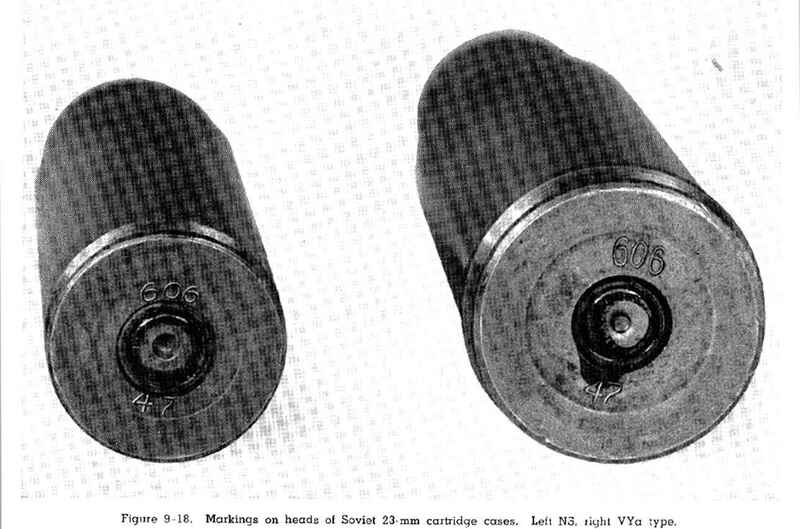 Comparison of Soviet 23-mm cartridge cases, both of which can use the same projectiles. Left case. old. for VYa type, right, new, for NS cannon. Figure 9 IS. 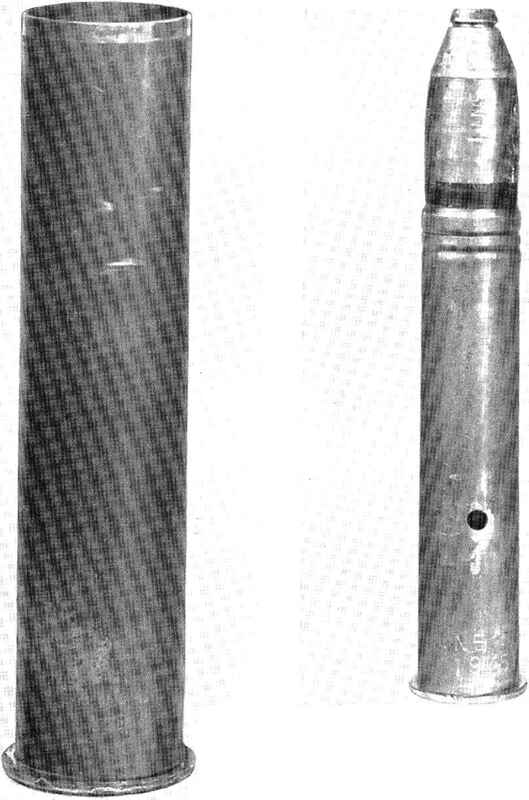 Aitis/s conception of cartridge case used in the Figure 9 20. The new, smaller, cartridge case used in the eld 37-mm NS canr.on. 37-mm Soviet "N" gun. 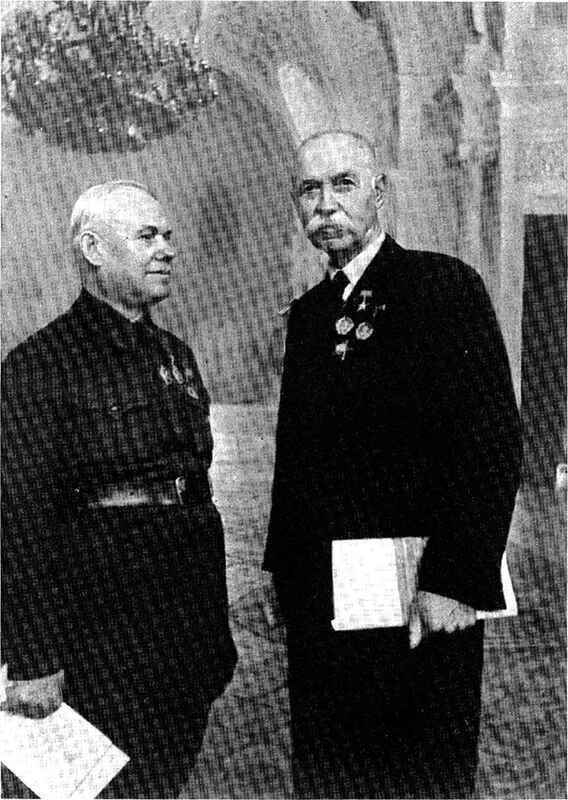 Figure 9 23. 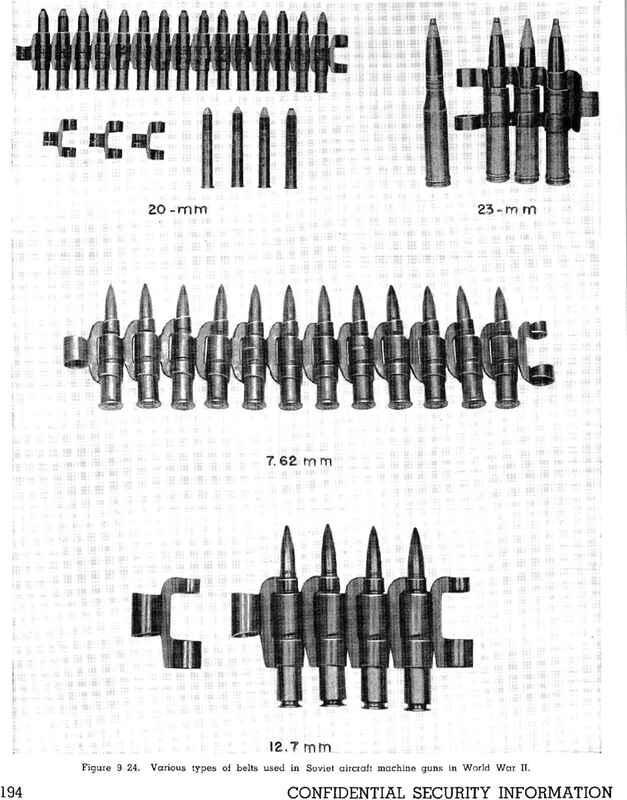 The cases unci links for the new 37-mm and 23-mm Soviet aircraft cannon. Both cases are Nudelman designs.